ORTHODOX Hindu Philosophy is generally divided into six systems or darsanas as they are called. They are: (1) Samkhya, (2) Yoga, (3) Purva-Mimamsa, (4) Uttara-Mimamsa or Vedanta, (5) Nyaya, and (6) Vaisesika. The respective authors of them are (1) Kapila, (2) Patanjali, (3) Jaimini, (4) Badarayana or Vyasa, (5) Gautama and (6) Kanda. 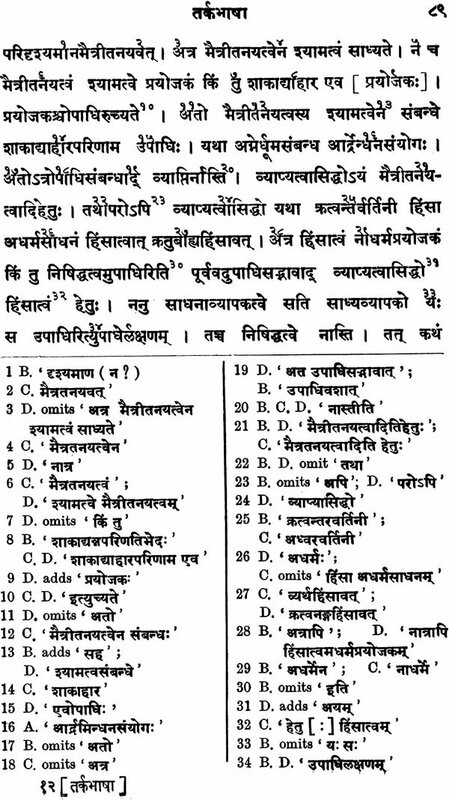 Samkhya and Yoga, Purva and Uttara-Mimamsa, and Nyaya and Vaisesika are frequently classed together and looked upon each as branches of the same school. Historically speaking every one of these pairs except the last was a separate system of philosophy originally and it is only in the case of the Nyaya and Vaisesika that we have got evidence, as we shall see subsequently, that originally they were two branches of one and the same school and that in later times they came to be somewhat differentiated one from the other. 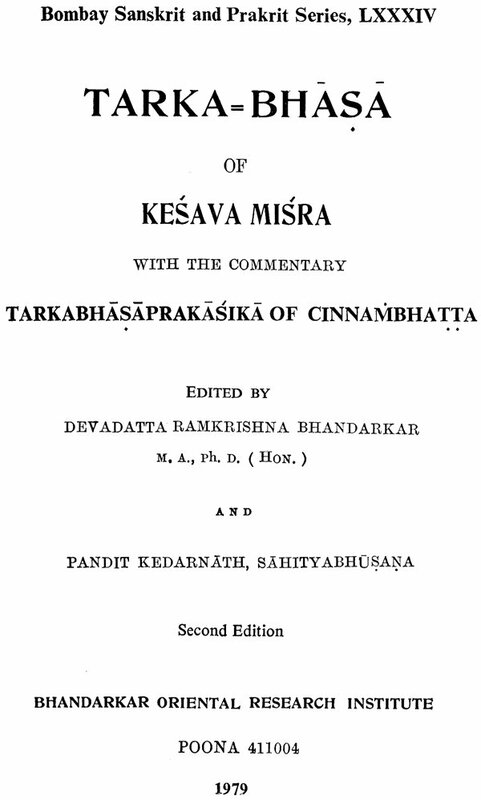 The Tarkabhasa of Kesavamisra conforms itself to the system of Nyaya, the fountain source of which is the Sutras ascribed to Gautama alias Aksapada. 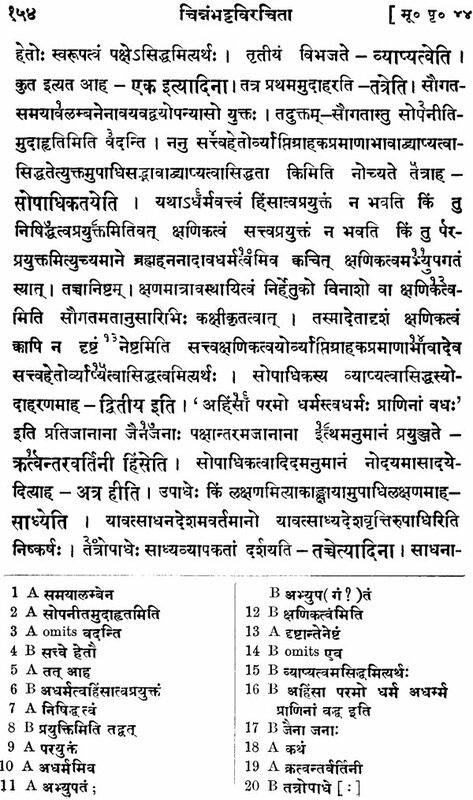 Upon these Sutras Vatsyayana, also called Paksila-svamin, wrote a commentary entitled Nyaybhasya. 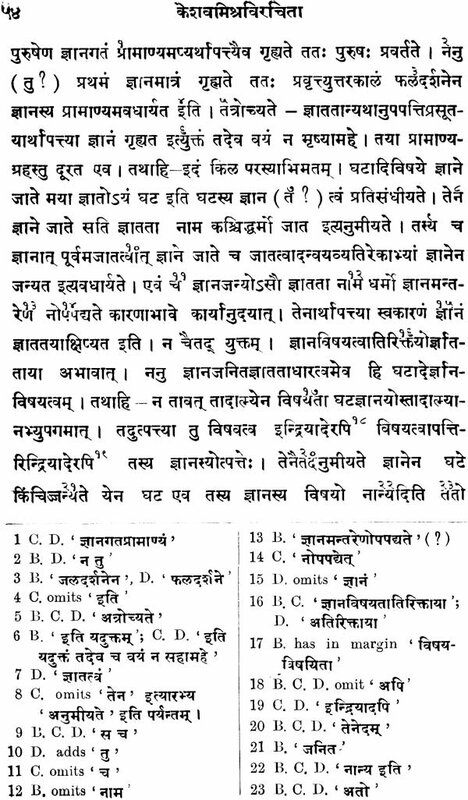 Upon the Nyaya-bhasya Bharadvaja, who assumes the designation of Pasupatacarya, composed a gloss (uddyota) called Nyaya-vartika and is for that reason known as Uddyotakara. 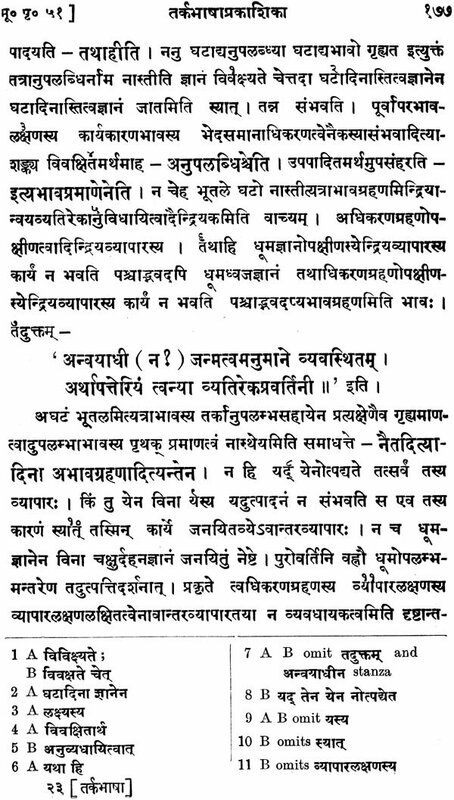 The Nyaya-vartika was commented upon by Vacaspatimisra in his Nyaya-vartika tatparya-tika, and this last, again by Udayancarya in his Nyaya-vartika- tatparya- parisuddhi. Besides these, there were many works of the Nyaya School, which were connected directly or indirectly with the Nyaya-sutra and its commentaries or which were independent treatises setting forth in detail one or more subjects comprised in them. The date of Gautama, the founder of the Nyaya system, is not definitively settled. It depends more or less upon the date and the present form of the Sutras, a question which will be duly discussed in the sequel. Vatsyayana has been attacked by Dignaga, a celebrated Buddhist logician. Dignaga’s works were for the first time rendered into Chinese in A.D. 557-69. 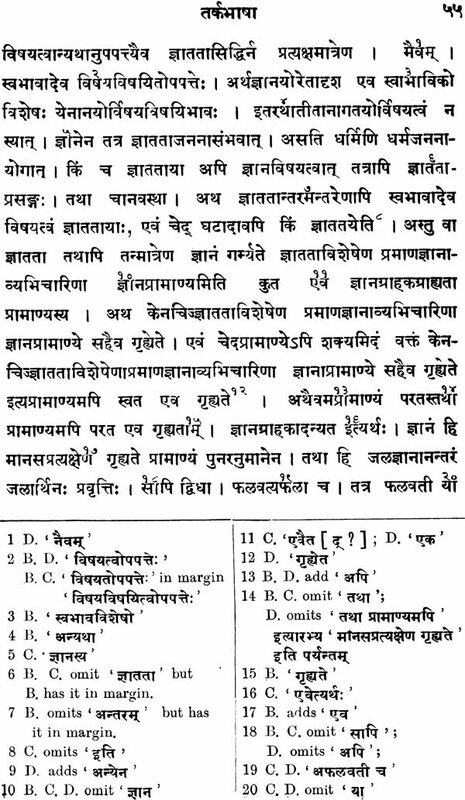 Dignaga is, therefore, assigned to the middle of the 5th century, and Vatsyayana to circa 400 A. D. Dignaga was answered by the Brahmana logician Bharadvaja Uddyotakara, who was in his turn criticized by Dharmakirti. Both have been taken to be contemporaries and ascribed to 633 A. D. Dharmakirti has been attacked by Vacaspati who, as we know from one of his works, flourished in A. D. 976. Udayanacarya, who commented upon Vacaspati, was very nearly his contemporary. 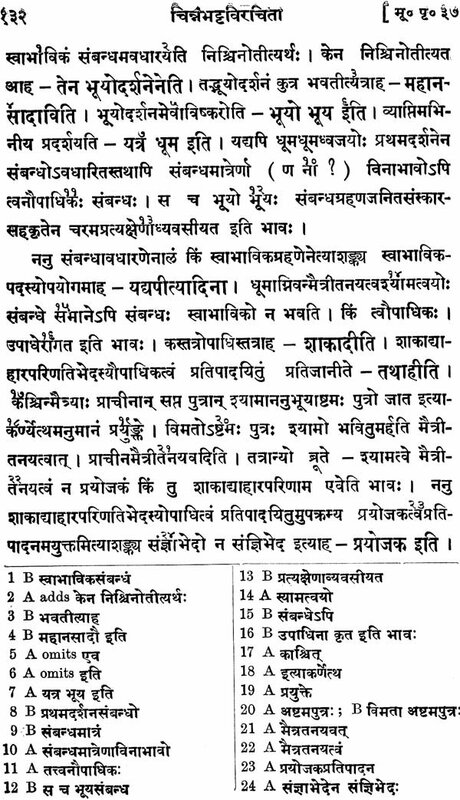 Curiously enough, this very is quoted by Madhavacarya in connection with the demonstration of the existence of Isvara, while giving an account in his Sarva darsana-samgraha of the Mahesvara system of philosophy called Saiva-darsana and distinguished from the other Mahesvara system called Lakulisa-Pasupata-darsana. 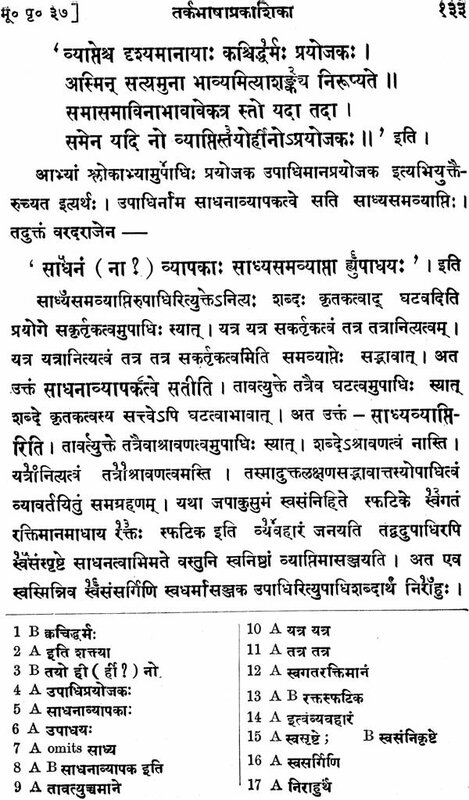 It thus appears that Nyaya represented the Saiva-darsana specifically so designated. And this agrees with the remark of Guna- ratna-suri that while the Vaisesikas were Pasupatas, the Naiyayikas were Saivas. The only objection that may perhaps be raised is that Bharadvaja, Uddyotakar, as he cites from the Saiva Agama, shows himself to belong to the Saiva sect technically called, whereas he designates himself Pasupatacarya. It has, however, to be borne in mind that Pasupats has both a generic and a specific sense, the first making it equivalent to Mahesvara and the latter signifying a sub-division of the Mahesvara sect. And when Uddyota- kara calls himself a Pasupatacarya, there is nothing to preclude us from taking it in its first, i. e. generic sense. Nay, we may proceed a step further. The term Isvara is employed by the Naiyayikas in a somewhat technical sense. It denotes not simply' God' but' Siva as God.' 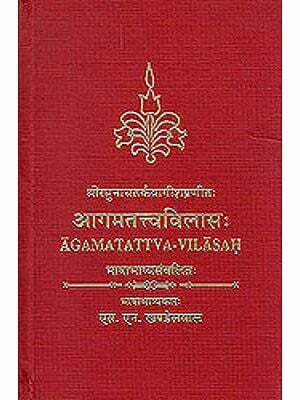 Now, in Gautama's Nyaya-sutra we have at least three aphorisms which prove the existence of Isvara. The presumption is that the Nyaya- sutra sets forth a Mahesvara system. Let us now turn, for a moment, to the Vaisesika darsana. We have seen that according to Haribhadra, the god of the Vaisesikas was Siva and that according to his commentator, Gunaratna-suri, they formed the Pasupata sect specifically so called. 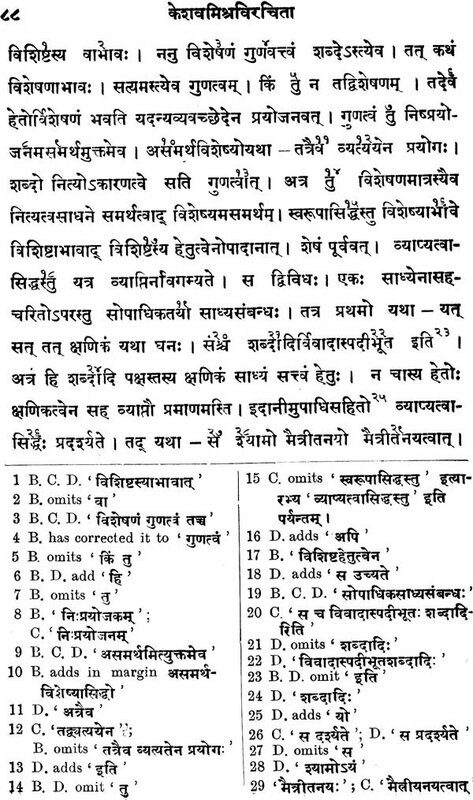 Of a slightly earlier age than that of the latter was Rajasekhara-suri (1348 A. D.), who wrote a gloss on the Nyaya-kandali of Sridhara, which itself was a commentary on Prasastapada's Bhasya. Rajasekhara tells us that Isvara ( Siva ) appeared to Kanada in the form of an owl (uluka ) in consequence of his religious austerities and instructed him in the doctrines of the Six Categories. This tradition is carried back to an earlier period still, for we find it narrated by Prasastapada also. 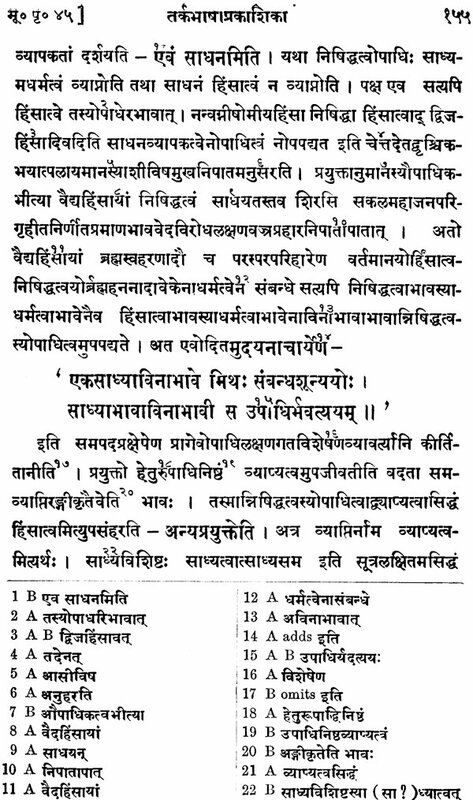 His Bhasya on Vaisesika-sutra ends with an obeisance to Kanada, who, we are told, composed the Vaisesika system after propitiating Mahesvara through his Yoga practices. This work similarly begins with an obeisance first to Isvara and next to the sage Kanada, In the body of the work also references to Isvara or Mahesvara are not infrequent. This clearly shows that about the middle of the seventh century A. D. Kanada was looked upon as a devotee of Siva and his philosophy as a Mahesvara system. It is true that no reference to Isvara is traceable in the Vaisesika system as it is, no doubt, found in the Nyaya-sutra. But that does not necessarily show that prior to Prasastapada the Vaisesika was not regarded as a Mahesvara system. A gain, as we shall see subsequently, there was no necessity of proving the existence of lsvara in the latter system, which therefore simply assumed It. That as a matter of fact Kanada as well as Gautama was considered to be connected' with Saivism long long anterior to the time of Prasastapada is clear, I think, from an unexpected and early source. 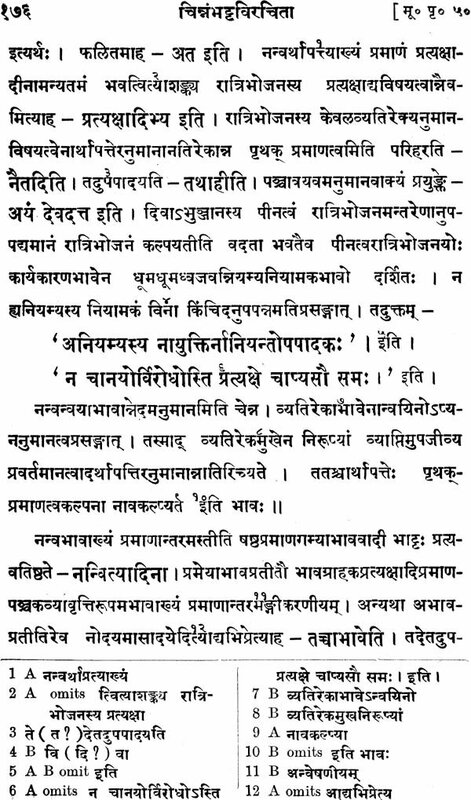 I have elsewhere shown what flood of light the concluding portion of Chapter XXIII of the Vayu-Purana throws on Lakulisa, the originator of the Lakulisa-Pasupata- darsana described by Madhavacarya. We have seen that this Lakulisa was the twenty-eighth, i. e. the last, incarnation of Mahesvara, Immediately preceding the account of Lakulisa we have a passage in the Vayu-Purana in which the twenty-seventh avatara of Mahesvara is alluded to. His name was Somasarman, and we are told that he flourished in Prabhasa which has been identified with Somanath- Pattan in Kathiawar. We are further informed that he had three pupils, viz., Aksapada, Kanada- Uluka and Vatsa. As Aksapada and Kanada are here associated one with the other, it is difficult to avoid the conclusion that the authors of the Nyaya and the Vaisesika philosophy are here alluded to and that both were looked upon as Mahesvara systems as early as the fourth century A. D. when the Vayu-Purana is supposed to have been recast in its present form. And we may deduce the further inference that according to this Purana, both the Nyaya and Vaisesika systems preceded that of Lakulisa in point of time.